Is there still a need to change the time up an hour, back an hour each year? I now never see the sun. I leave for work at 6:30, I arrive home at 6:30. I don’t like it. I don’t like going and leaving work in the dark, it makes the day appear that much more longer. I understand the concept of the time change for the past century, to let farmers work the fields longer with more daylight, to let people save money during the install of electricity and during war-times but can we now quit doing this? The farmers all have lights on their equipment and can farm all night long if they want. Electricity is installed all over the world now, and the one hour of daylight for 6 months early isn’t saving nearly as much as it used to. So lets quit this time change thing, and get back to normal time year round. Let Mother Nature back at it again. 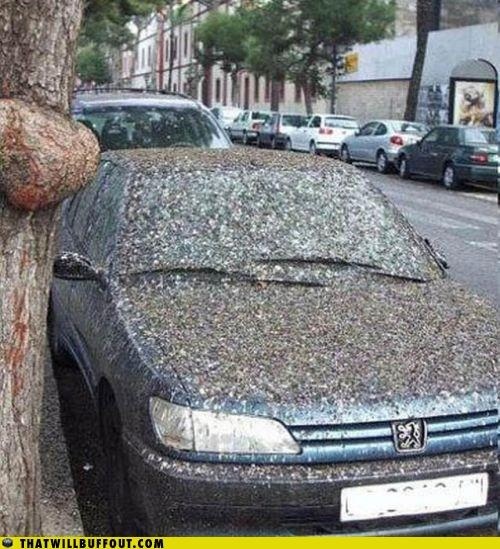 The week or two after time change I feel like this car parked under a tree of birds. This entry was posted in Opinions and tagged time change. Bookmark the permalink.